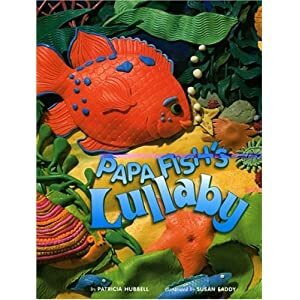 Today I chose the book Papa Fish's Lullaby by Patricia Hubbell. I like this book because it is illustrated completely with clay. I am just fascinated at the illustrations. They are so intricate and creative!! After we read the book, I let my girls create with clay. First we talked about what they might like to make.Isabella decided to make a dog and Aubrey wanted to make a flower. I gave them the clay and let them create. I loved watching them...I confess that I was unsure how the finished products would turn out. I didn't help them at all so I was amazed at the results! Isabella's dog...) It is wearing a sweater! I was reminded after doing this activity that my girls are filled with creativity. Sometimes I need to get out of the way and let that creativity come out!